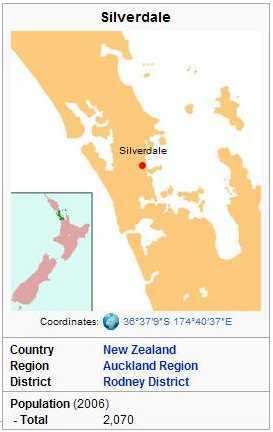 Silverdale is a village approximately 30km north of Auckland in the North Island of New Zealand. It is located on the north bank of the Weiti River and lies to the west of the Whangaparaoa Peninsula. It was formerly called Wade (a corruption of Weiti) but renamed Silverdale in 1911 because of the many poplar trees in the area at the time and also because it is situated in a dale. State Highway 1 passes to the west of village via the Northern Motorway. The former State Highway 1 runs south-west to north-east through the village, the section from the interchange of the motorway to the northern end of Orewa, where it rejoins State Highway 1, is currently known as State Highway 1A and is the designated route for heavy vehicles. With the completion of the Northern Motorway to Puhoi in 2009, it is expected that the State Highway designation of this road will be rescinded. The population of Silverdale and its surrounds was 2,070 in the 2006 Census, an increase of 459 from 2001. Silverdale School is a full primary (years 1-8) school with a decile rating of 9 and a roll of 166. The school was founded in 1869 and moved to its current site at the end of 2006. Stella Maris Primary School is a state integrated full primary (years 1-8) school with a decile rating of 10 and a roll of 288. The Catholic school opened at the beginning of 2005. This page was retrieved and condensed from (http://en.wikipedia.org/wiki/Silverdale) see Wikipedia, the free encyclopedia, January 2009.